Developer Leo Pustilnikov, who plans to purchase and redevelop the aging AES Redondo power plant, has expressed interest in multiple city-controlled leases in Redondo Beach’s harbor, indicating potential for a comprehensive waterfront, master-planned by a single developer. Previous redevelopment projects by the LA-based Pustilnikov include the Sears building in Boyle Heights and the Alexandria Hotel in Downtown Los Angeles. In October, he was identified as a potential buyer for the AES power plant, and has since acquired portions of that property. City documents confirm Pustilnikov is in negotiations over harbor-area property that includes portions of the Redondo Beach Marina leasehold, formerly held by Decron leasehold, and now controlled by the City. County assessor ID numbers in a recent Redondo City Council agenda indicate that Pustilnikov is negotiating with the city for portions of seven parcels that stretch between Portofino Way and the Redondo Beach Municipal Pier. The area in question includes 60 boat slips, the boat hoist, and the Samba, Captain Kidd’s, R-10 and Ruby’s restaurants. Decron Properties controlled parts of those parcels for about six years until 2014, when the City purchased the master lease for $12 million, as part of a long-standing Harbor Asset Management Plan. 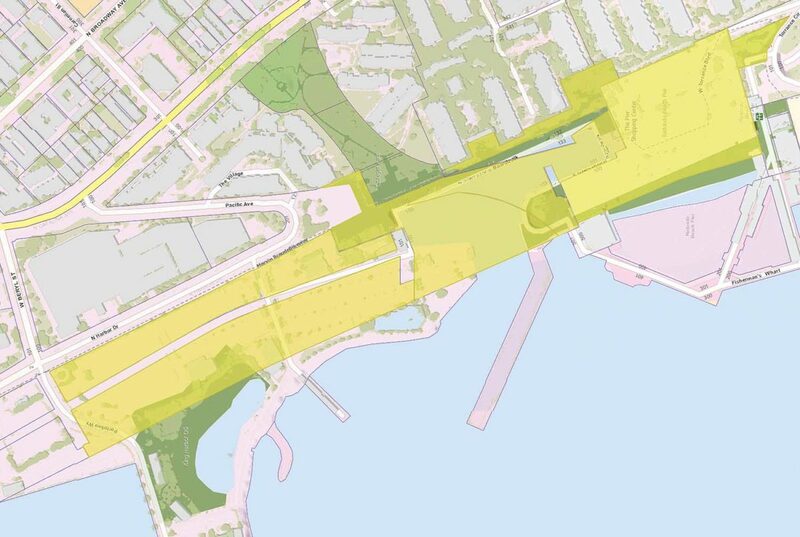 Those leases, combined with other city-owned leases, were then offered to CenterCal Properties, the city’s estranged partner in waterfront redevelopment. CenterCal is currently suing the city over severing an agreement for a lease framework, called an ALPIF, for $15 million. That lawsuit, city sources say, is preventing the city from establishing long-term plans — and leases — on ALPIF-affected properties. In an interview, Pustilnikov did not expand about the former Decron property, nor his interest in the former Gold’s Gym, which was also noted on the agenda. But Pustilnikov said he was interested in the Monstad Pier leasehold, the southernmost wooden structure that was connected to the main Municipal “Horseshoe” Pier in the early 1980s. He said that he would like to renovate the area and to “bring something nice to Maison Riz,” a vacant restaurant. The Monstad Pier leasehold totals about 15,000 square feet. The Monstad lease was controlled by Redondo Fisherman’s Wharf Co. before before being acquired by the City. Broker Brian Campbell, of BC Urban, LLC, began marketing the property last year. “There’s been a reasonable amount of interest in the property, but it’s not your typical real estate transaction,” Campbell said. “You’d be buying the remaining ground lease on that portion of the pier, which runs for only 15 more years. That very much limits its value, because there’s no guarantee that you’d be able to get an extension.” The extension would have to be issued by the city, which manages ground leases in the State Tidelands. Tuesday’s agenda also included negotiations with Jean Trutanich, of Tony’s on the Pier, regarding property addressed between 110-151 Fisherman’s Wharf, located on Monstad Pier. City Councilman Todd Loewenstein represents the area, and declined to comment on the real estate negotiations. Pustilnikov’s growing interest in the Redondo Beach waterfront could lead to a comprehensive Waterfront Master Plan, which has long been the apple of Mayor Bill Brand’s eye.